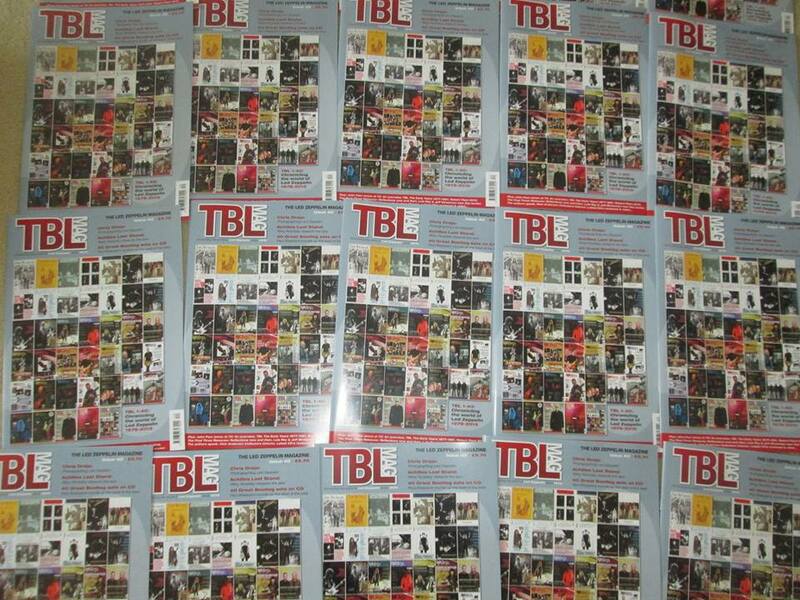 TBL 40 mail out update: I counted them all in and I counted them all out…TBL 40 is out on the streets – as of Tuesday, every subscriber copy and pre order is in transit. 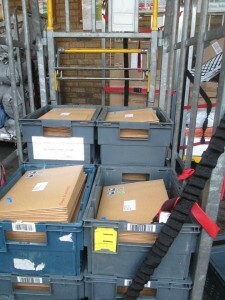 The pic below shows the scene at the main Bedford Royal Mail sorting office as I dropped the bulk of them off. Looking over the contents, I’m well pleased with how it has turned out – particularly as it was edited and assembled during some difficult times here with Janet’s mum being poorly. My thanks goes out once again to Mick Lowe for another TBL design classic – and to the contributors to this issue namely Richard Grubb, Rikky Rooksby, Paul Sheppard, Nick Anderson and Scott Heck. Plus Mike Tremaglio, Dec Hickey and Gary Foy for proof reading and admin. The end result is another TBL outpouring – 40,00 words of it. 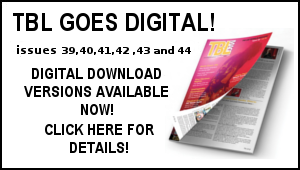 ALL current TBL subscriptions end with the forthcoming TBL 40 – so now is the time to re subscribe for the next three issues – TBL 41, 42 and 43. There’s a flyer in every issue of TBL 40 to alert you to do this. Please subscribe as soon as possible – subscriptions are the lifeblood of the TBL operation – again your support in advance is much appreciated. 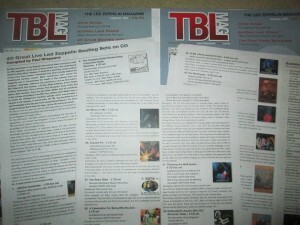 If you are not a TBL subscriber – now is a great time to sample the TBL mag – don’t miss out on this landmark TBL issue – essential Zep reading for the Christmas and New Year holiday. “Tight But Loose” Issue 40. Forget Santa bringing his presents on Christmas Eve, a much better present was delivered by the Post Office today, Issue number 40 of TBL. A 40th issue celebration no less, the front cover has every issue from number 1 in 1978 to number 39 in 2015 featured in miniature on it. This is a landmark issue of a landmark publication. When you add together the combined articles contained in these magazines, you are getting a superb body of research, hard work and interviews. TBL 40 opens with looking at the latest news about Robert Plant, including the amazing gig he played for his old bandmate Francis Dunnery in the small Cumbrian town of Egremont. This is followed by a most interesting interview with Chris Dreja, formerly of the Yardbirds in connection with a photographic exhibition in London. After this, and it is really nice to see space devoted to him, the first part of hopefully a series of articles celebrating the prodigious musical output from the genius that is John Paul Jones, who will be 70 in January 2016. As this is the landmark 40th issue, the driving force and powerhouse behind the magazine, and so much else in all things Led Zeppelin, Dave Lewis, recounts in considerable detail how the project began in the late 1970s and takes us up to the start of the 1990s. This is really interesting and gives a lot of insight into the dedication and tremendous hard work and research that Dave puts into everything that he does. Presence was blasted out to the neighbourhood most evenings. The last three of the Jimmy Page supervised album reissues are covered in great detail by Dave, always illuminating and very helpful to have his take on everything. 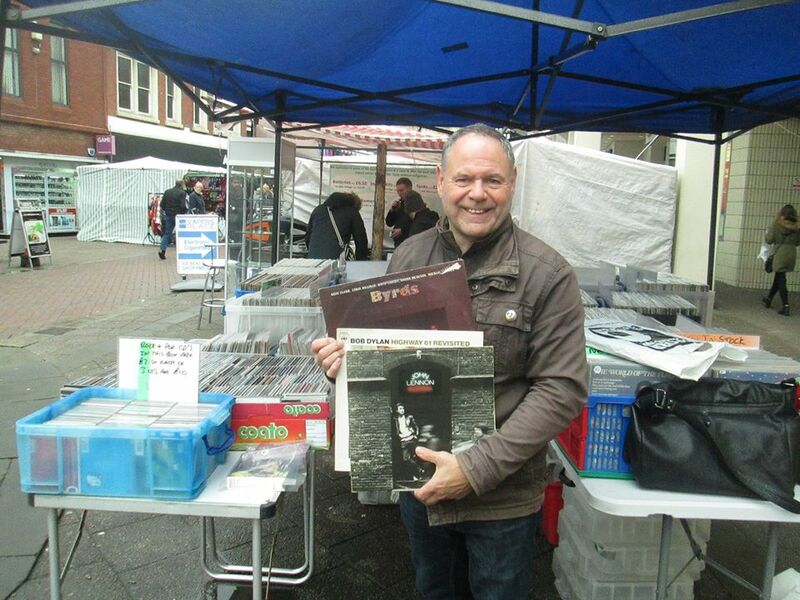 And then we have an excellent 5 page article from my old friend Paul Sheppard, with his personal selection of his favourite 40 bootleg CD releases. 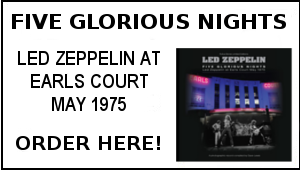 There are some classic releases discussed, of many of the band’s greatest concerts. Nice one Paul! 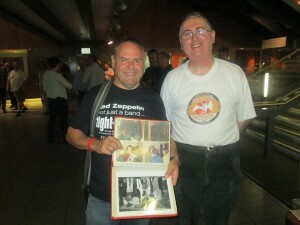 This is followed by an interview with Luis Rey, about how his new book “The Led Zeppelin Tape Documentary” came about. I won’t say too much as I am one of the editors, but in my (impartial) opinion it is a superb book! His list of outstanding concerts is very useful as a ‘go to’ selection. In fact when I was working on the book, having read a glowing review, my next course was to track down that concert on the Internet and give it a blast through my Sennheiser bluetooth headphones. 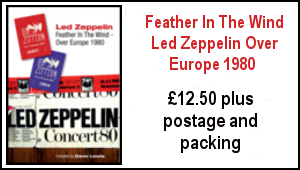 Finally another forthcoming book that looks extremely interesting, from Jeff Strawman, about the Led Zeppelin Gear used by them. I am sure this will be a tremendous read and a mine of information for all us trainspotters. Still there is more! Nick Anderson looks at recent rarities that have come up for sale, and to finish off Scott Heck looks at some recent CD releases. The Empress Valley box set covering the 1973 Madison Square Gardens concerts in particular is a beauty, and I did succumb to that one too. The inside back cover has a full page advert from tribute band Whole Lotta Led, a great band, I have known Geoff and Nick for many years, great guys and devoted to their music. In the introduction to the magazine on page 2, Dave pays tribute to four outstanding fans who are no longer with us, Paul Kelvie (drummer with Simply Led), Howard Mylett (band photographs extraordinary), Alan Johnston, and Gerard Sparaco, whose boot CD reviews were a model of musical scholarship. 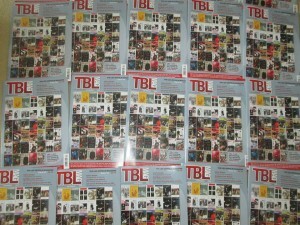 Many thanks for all your support and kind comments for this landmark TBL issue. Johnnie Walker Meets Jimmy Page, BBC Radio 2, Dec. 30th. ‘Johnnie Walker Meets Jimmy Page‘, two hour special will be broadcast 17:00-19:00, December 30th, BBC Radio 2. Page explains that his plans for a new album and tour have been delayed due to the long-running Led Zeppelin reissue campaign – in which all of the band’s studio albums were repackaged with ‘companion discs’ of previously unreleased material. Creative Dialogue VIII will take place 19th-28th June 2016 again in Santa Fe, NM. Magnus Lindberg and Anssi Karttunen will be joined on the faculty by the English multi-instrumentalist and composer John Paul Jones. The final concert will be once again at the St. Francis Auditorium on the 28th of June. In January, BBC 4 will be airing Music Moguls a three part series on the behind the scenes side of the music industry. The first episode will focus on the pioneering managers including Elvis’s Col Tom Parker, The Beatles’ Brian Epstein and Peter Grant. TBL Archive: The First Reunion – Golden Lion December 15th, 1981. As this date passed by on Tuesday – it rekindled memories of the first public reunion of Jimmy Page, Robert Plant and John Paul Jones which I was lucky enough to be in attendance. Back in the early months of 1981, Lynn Sizemore who was PR to the Golden Lion Roadies Charity For Children Association, the charity formed from the Fulham pub often acquainted by the Zep / Swan Song entourage, approached me to publicise in the next issue of TBL, a children’s charity raffle being held in December – I was only too willing to help and we began planning how this would all work. The raffle was duly featured in TBL issue 6 which came out in the late summer of 1981. I had a few meetings with Lynn during this period including one memorable occasion at the Golden Lion pub in Fulham. 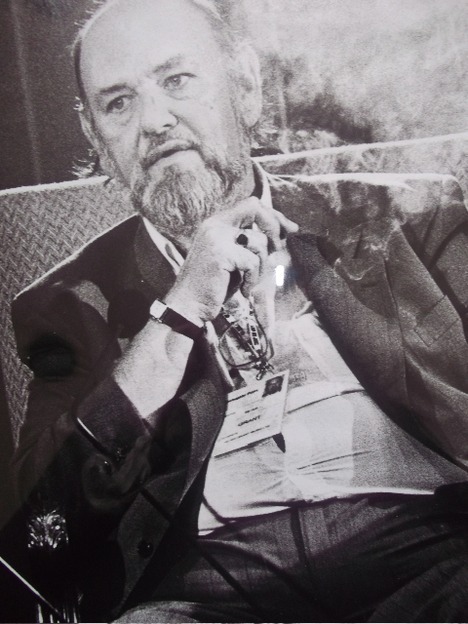 Robert’s sound man Benjii Lefevre was in attendance and I was introduced to John Bindon the notorious London character who had been with the Zep entourage on the 1977 tour and involved in the infamous Oakland fracas. Robert and John Paul Jones had already promised to attend and give prizes out on the night set for December 15th so it was always going to be a special evening. Even more so after the call I made to Swan Song the week before the event. Sian at Swan Song informed me that Jimmy was also due to attend. It duly turned into something of a grand Swan Song reunion in true Zep style. On the night itself, Peter Grant arrived with Jimmy around 8.30. A combat attired Robert and smartly dressed JPJ were already in tow. Various roadies and Swan Song employees were there as was John Bindon again. 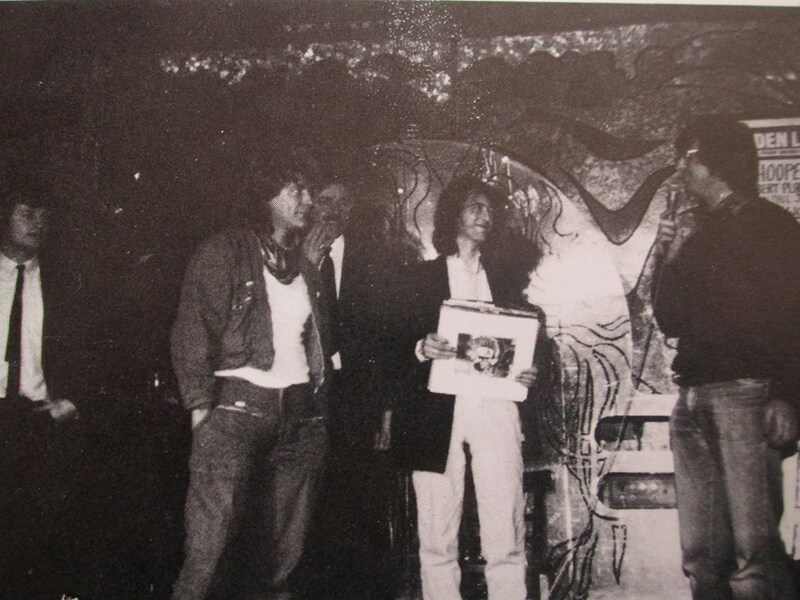 Tom Locke and I spent a memorable night in the pub as Jimmy, Robert and JPJ mingled by the bar and duly got up on stage to present the prizes of Jimmy’s Yamaha acoustic guitar (wonder where that is now?) and a set of personally signed albums. The main winner was an American guy while runner up was, Steve Simmons a TBL subscriber from Bristol. Here’s a pic of Steve on stage receiving his prize. Jimmy looked in better shape than he had in Europe the previous year and told me he was working on the Death Wish 2 soundtrack. As a Christmas present I gave Robert a copy of a large format History Of The Blues book (wonder if still adorns his book shelf?) to which he acknowledged with the classic “Eye Thank yew” catchphrase so prevalent on the Over Europe tour. I took the opportunity to tell Peter and Atlantic’s Phil Carson of my plans to write a major reference work on the band’s music though it would be another eight years on in the Marquee (at a Jason Bonham gig) when I was able to tell the pair of them that the book (Led Zeppelin A Celebration) was soon to be a reality. As we were making our way into the arena for Robert’s Sensational Space Shifters show amazingly enough I bumped into Steve Simmons for the first time since that night at the Golden Lion back in 1981. Steve was carrying a photo book of the pics he took back then – we had a good old chinwag about how he had been the runner up in the competition and the signed albums he was presented with on that night all of 34 years ago. Well there’s a turn up – a Bob Dylan song is very like to be the UK Christmas number one via the X Factor. What with his brilliant new archive release Bob Dylan 1965 -1966 The Cutting Edge, it’s going to be a bit of a Bob Dylan Christmas – no bad thing. We had hardly watched the X Factor here this time around but we did clock the final – The X Factor winner Louisa Johnson is a talented singer and good luck to her. As for her version – I can’t hear much of the original tune in there – the lovely version by The Pretenders (see YouTube clip below) is much more in line with Bob’s original. On the player: Slade – Slade Very Best Of – what a great singles band they were – back in the day when singles really meant something – and of course it includes the perennial Merry Xmas Everybody, Bruce Springsteen Born To Run – my Springsteen allegiance has been revived with The River reissue, David Bowie Hunky Dory (maybe his best album? ), The Beatles Revolver – it will be 50 years ago next year… thoroughly enjoyed the recent Nations Favourite Beatles Number One show on ITV 1. Plus Led Zeppelin Live On Blueberry Hill – I had this back on to mark the day I first received the Trade Mark of Quality double album December 15 1972 – just a few days before I saw them at the Alexandra Palace – more on that subject next week. A bit of seasonal fare has also been on including the classic Greg Lake Christmas single first issued in 1975 when I bought it – it’s still one of the best Christmas songs ever. 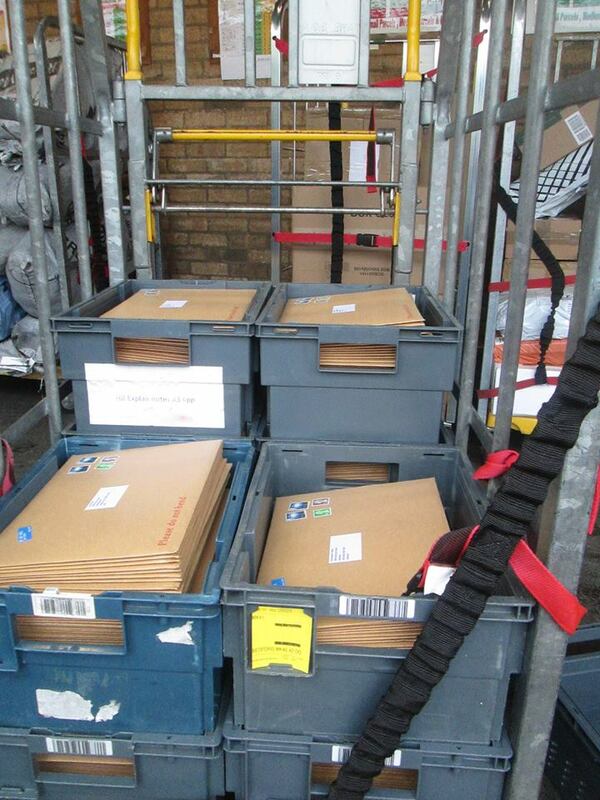 With a week to go, there’s the usual rush to get everything sorted for Christmas – and It’s been a very busy couple of weeks here with the TBL 40 mail out – it’s a very big relief they are all out there. 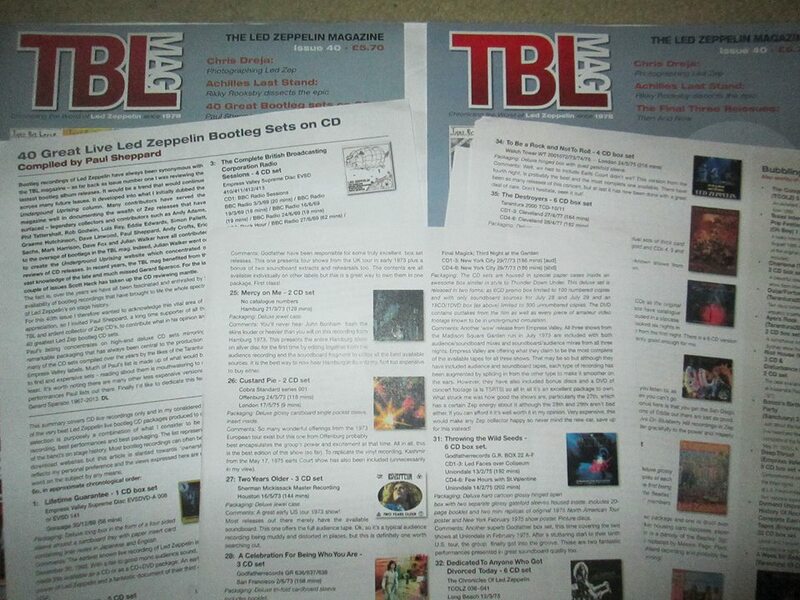 The attention now turns to planning the TBL 2016 strategy – this includes major work on the Evenings With Led Zeppelin book project with Mike Tremaglio, the planning of content for TBL 41 and various other TBL initiatives. More on all this soon. Dave Lewis/Gary Foy – December 17, 2015. Silly party night 15 dec. 1981.Thank you Dave for that night.I spoke to Peter Grant ,John Paul Jones,Robert Plant and Jimmy Page.Robert went behind the bar and served drinks .When i bought him back one he was amazed and confused.Peter was amazed when i asked for his autograph.Dave it was a good day at John Bonham memorial in Redditch. Thanks again for TBL 1981. Robb. I think the weight of expectation is also huge as any new CD as it will be his first full release of new material since 1998 (with Robert). Don’t get me wrong, I like his Soundtrack series & Death Wish re issues, but his frequently promised new release of new material is way overdue. Also for someone who says he loves being on stage then only 1 full length concert in nearly 15 years (the O2) is no where near enough. 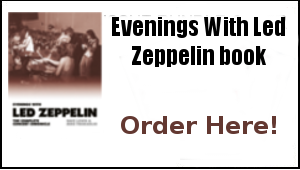 Its interesting that Robert often gets blamed (on web forums) for not to go out as Zeppelin anymore, but just look at how many really good records and tours he has done since Zep folded in 1980 compared to Jimmy’s output. You also have to ask yourself that in Jan 2016 he will be 72 & time marches on for everyone. I wonder how nimble those 72 year old fingers will be? I am sure he is up to the challenge, I just wish it could have been done sooner. Anyway, Happy Christmas to all TBL followers and to you Dave Lewis and your family. Here’s to a rocking 2016. Just heard that Boleskin House has been almost totally destroyed by fire. Page will be 72? next year. Aside from the 02 reunion, he virtually retired from performing and recording at the start of the naughties. That’s 15 years without any substantial new music. I know there were Zep reissues and live releases, but plenty of artists of his coeval (McCartney, Neil Young) do archive releases and also create new music. The two aren’t mutually exclusive. True, he doesn’t owe us anything, but to be deliberately coy and tease fans year after year by saying “I’ll be on stage next year and it’s going to be different, blah, blah, blah,” has worn thin. It makes him look like a bullshitter. Best to say I’m done, or actually do something. With all these new pledges to hit the stage in 2016 he’s painted himself into a corner and has to deliver, or his credibility is well and truly shot. Just had a look at the link regarding the Classic Rock / Team Rock interview. I understand why some of the comments below that article are somewhat sceptical regarding Jimmy recording & touring in 2016. I really hope he does do something this time otherwise he will be looking like ‘the boy who cried wolf’ if nothing happens in 2016. Anyway, Happy Christmas to everyone involved with TBL and issue no 40 is fab. I look forward to the Radio 2 interview with Jimmy over Christmas. TBL 40 is a real treat. So many words to plough through…you read one page and you just keep turning those pages for more. Lapping it all up Dave, you do yourself proud every time. Thanks to all the contributors as well for their input. Especially enjoying Richard’s JPJ feature.